On last night's episode of The Ezra Levant Show, I reported on Canadian Foreign Affairs Minister Chrystia Freeland posing in a photo-op with a young Saudi woman she "rescued" from a Bangkok hotel. At the same time, Freeland has remained silent on China sentencing a Canadian citizen to death. I like the fact that she wants to be free. That she’s a woman. That she rejects Islam. What a pleasant change from the Muslim extremists who flood into the west, seeking to colonize and convert and bring sharia law — this woman looked like the opposite, didn’t she? The fact that she’s a pretty teenager who speaks English helps, too. At least that’s what Chrystia Freeland, our foreign minister, must have thought. She’s had a terrible month. China has seized thirteen Canadians as payback for our lawful arrest of a Chinese tycoon named Meng Wanzhou. They’re still holding several of them, including a former diplomat. So Freeland saw an opportunity for a quick media win. This young woman, Rahaf Al-Qunun, originally wanted to go to Australia. Australia was considering her application for asylum, looking into the facts of the case. But Freeland moved faster. She didn’t need an immigration hearing — She'd seen tweets! 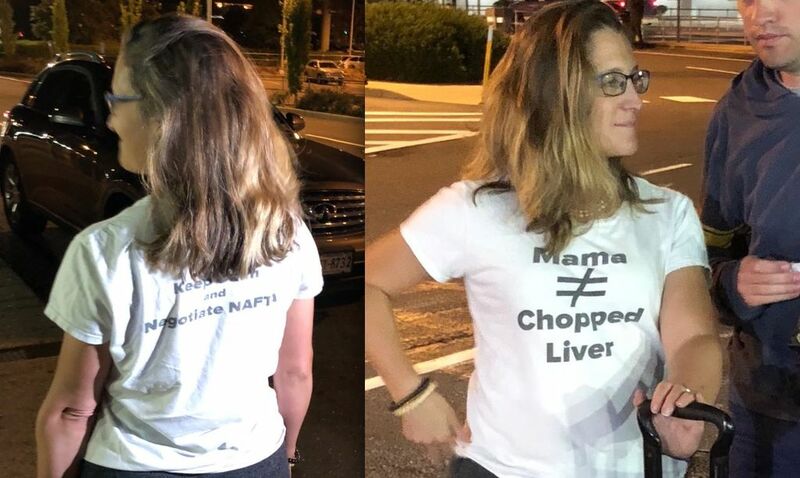 So Freeland brought Al-Qunun to Canada on the weekend — and made sure she was there to mug for the cameras at the airport. You have to see her weird, domineering, handsy, smothering showboating with this telegenic young woman. This situation wasn't really a crisis. But it was a great opportunity for Chrystia Freeland. After a one-day trial, a Canadian has been sentenced to death in China, for drug smuggling. He wasn’t originally sentenced to death there. But they kicked it up a notch after Canada arrested Meng in December. At least as I go to air, Chrystia Freeland hasn’t put out a public statement on this Canadian sentenced to death in China. And she's offered no help for Asia Bibi, a Christian who has been sentenced to death in Pakistan, for blasphemy, because she would not submit to Islam. Ezra… By the way.. You’re one of the best.. Keep on truck’in… and thanks. Hey Trudeau.. Will she be charged under your criminal organization’s Law M-103? There isn’t sufficient evidence to convict him in a western court. Yes he has a history in Canada, but what exactly, we don’t know. I don’t trust the Chinese. We do more for Justin’s pseudo citizens. Canada has an obligation to save this guys hide. Freeland lassoing Rahaf before the Australians got her will set a precedent in Canada for ‘instant entry’ and top of the line treatment of anyone who desires the good life in Canada. This is not good. I think there is much more to this story than meets the eye. We are being hoodwinked, of that there is no doubt. I don’t’ care about drug-dealer Schellenberg. I’m sure he knew death sentences for drug dealers are on the table in many countries around the world. Yes, Freeland should push for Bibi’s expulsion to a western democracy, including Canada. Remember this little chestnut? Maybe she needs to keep calm and negotiate a release? So we have a drug trafficker already convicted in Canada of drug trafficking in 2012. He just couldn’t keep his nose out of it. As I see it, its a win win for Canada. He’s an undesirable in Canada. If they keep him in jail for life Canada wins. And if the execute him Canada still wins and China looks like the autocratic totalitarians that they are. Do we really want the inveterate drug user/trafficker back here under any circumstances? Schellenberg got himself into this with his illegal activities. He’s useless to our society except as an example of Chinese cruelty. Christia is a good little Librano. Government by virtue signalling……no substance. All paid for by taxpayers of course!